A British company thought to be working closely with Apple has created a hydrogen fuel cell for an iPhone 6 that allows the device to go a week without recharging. According to reports, Intelligent Energy has created a working iPhone 6 prototype that looks no different from any other iPhone 6 except for tiny vents in the rear that allow imperceptible amounts of water vapor to escape. The prototype contains both a rechargeable battery and its own hydrogen fuel cell, according to a report in the Telegraph. Hydrogen fuel cells generate energy by combining hydrogen and oxygen; the only emission from the process is water. 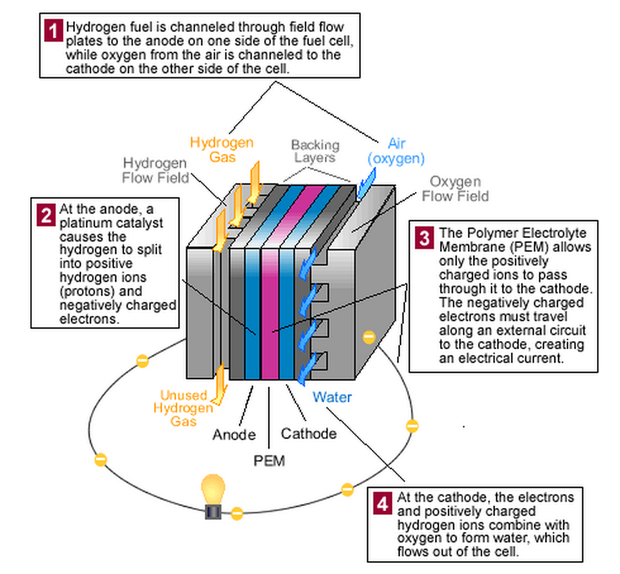 Fuel cells supply hydrogen to a negative anode (an electrode through which electrical current flows), releasing electrons. The electrons then flow to a positive cathode (another electrode) to generate electricity. In addition, after releasing electrons, the hydrogen becomes a hydrogen ion moving to positive cathode and bonding with oxygen in the air, forming water. How a hydrogen fuel cell generates electricity. Hydrogen is the simplest and most common molecule known to exist. Bbecause of that, it is a part of almost every other substance, such as water and hydrocarbons. Hydrogen is also found in biomass, which includes all plants and animals. Intelligent Energy has produced more than 2,000 patents related to fuel cells, which it has used to create batteries for cars, among other things. Like any fuel cell, the one in Intelligent Energy's iPhone requires recharging with hydrogen gas. Intelligent Energy said that could be done through an adapted headphone socket. Intelligent Energy is now working on a commercial version of the smartphone fuel cell that would be in the form of a small cartridge that fits into the bottom of a phone. The cartridge would supply power for a week and could be discarded after use. Intelligent Energy's finance chief, Mark Lawson-Statham, told the Telegraph that the smartphone fuel cell technology is still a couple of years out from being commercialized.